The finalists in the 2018 Designers Institute’s Best Awards (for excellence in spatial, graphic, product, interactive and motion design) are waiting with fingers crossed for the winners to be announced on September 22. We’ll showcase our pick of the champions in our December/January issue – but for now, take a look at some of the leading contenders. 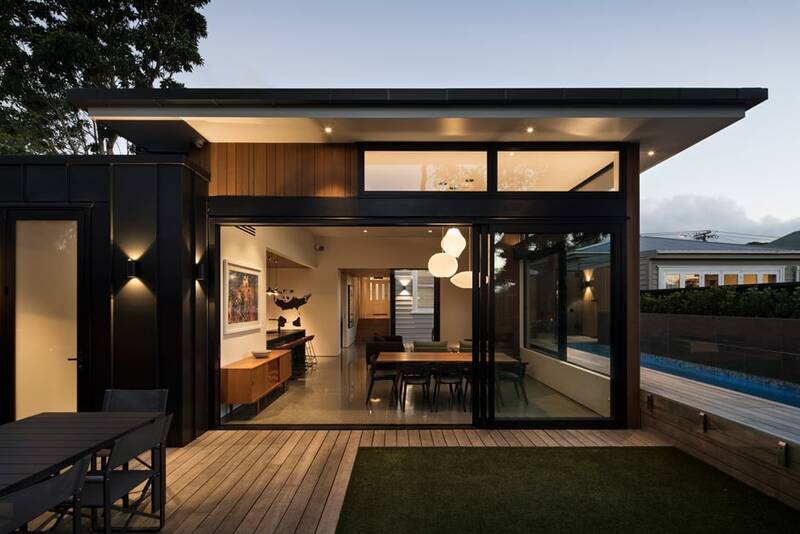 TOP & ABOVE Akaroa Maison Rue Jolie by Pac Studio and Glamuzina Architects. 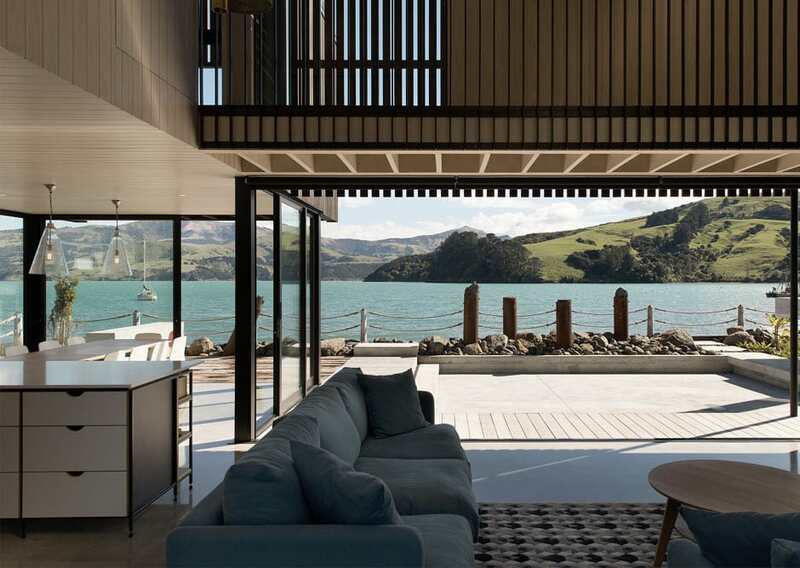 Located on a waterfront site in Akaroa, this house combines contemporary design with a sensitivity to the scale and aesthetic of the existing built environment. 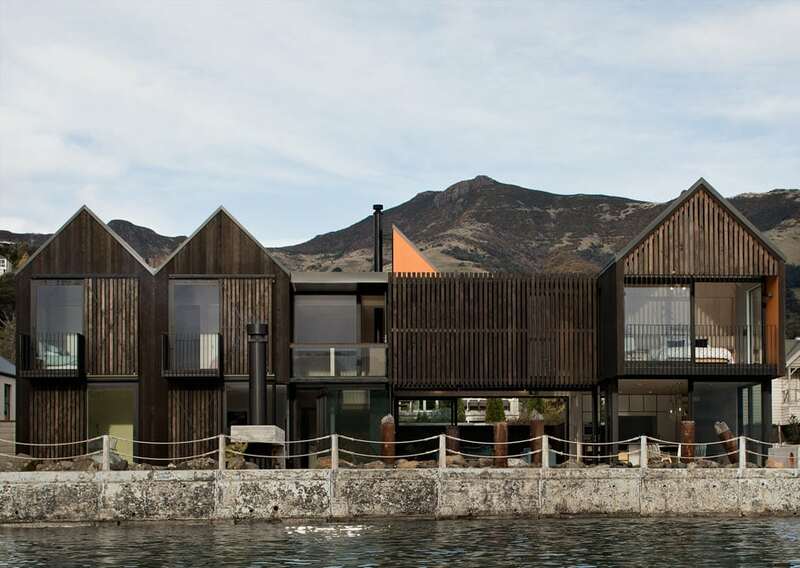 The building is broken into a series of discrete, steeply pitched roofs that recede and push forward, creating the look of a number of modestly sized buildings and maintaining the intimate, mostly small-scale built form of the area. 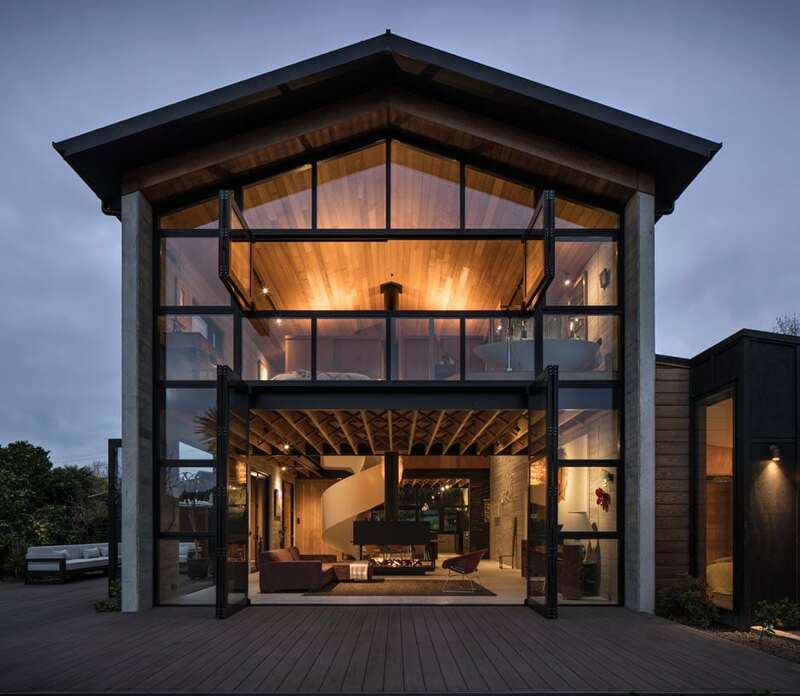 Perpendicular window proportions and vernacular materials evoke a sense of regional familiarity. From a distance or when walking by, this house appears as a series of ad-hoc gabled buildings, each with slightly different character for variety and interest. Large areas of glass frame expansive views of the picturesque landscape of harbour and hills, while a series of timber shutters complement the overall aesthetic and enable the house to be enclosed when not in use. ABOVE The Stage and The Cave by Rogan Nash Architects. 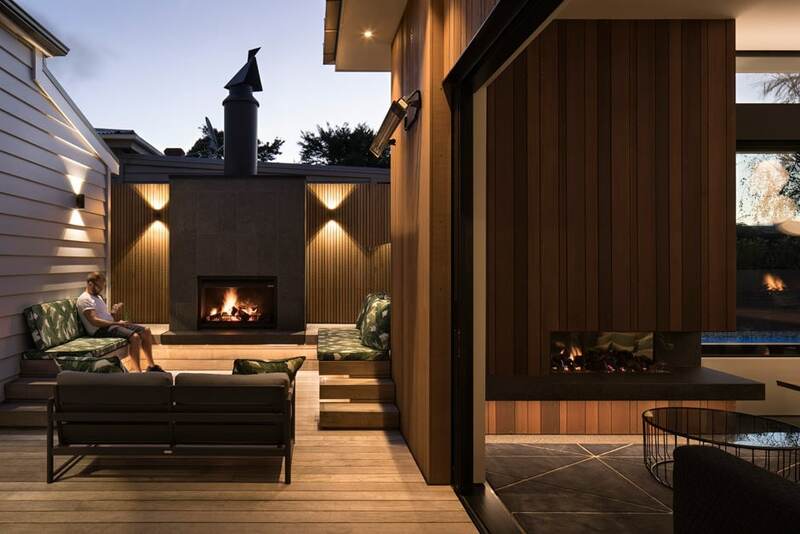 This thoughtfully renovated character villa in Auckland’s Herne Bay makes the most of its long, thin site. The design plays on the Frank Lloyd Wright concept of compression and release, which in this design is imagined as ‘The Stage’ and ‘The Cave’. 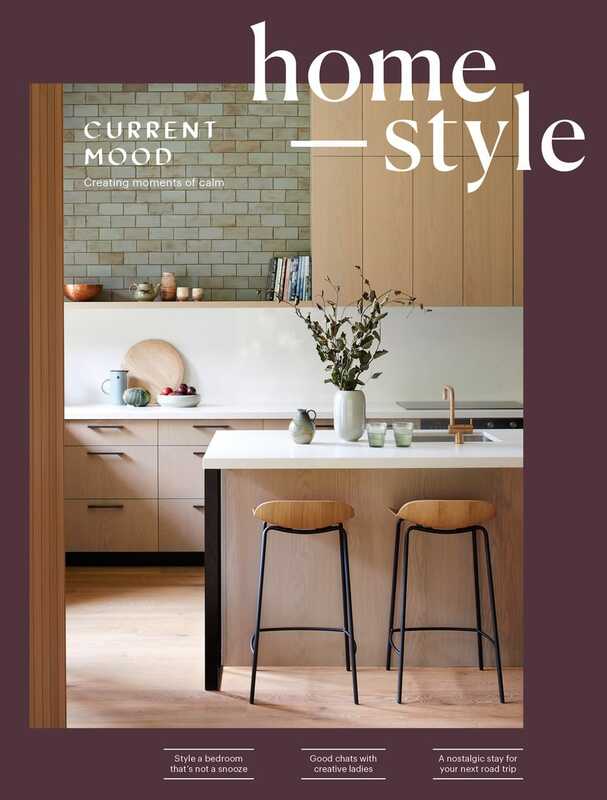 The kitchen forms part of ‘The Cave’ that anchors this room with a lower stud and is formed from walnut and granite, creating a moody atmosphere. It opens onto the double-height dining room, known as ‘The Stage’. 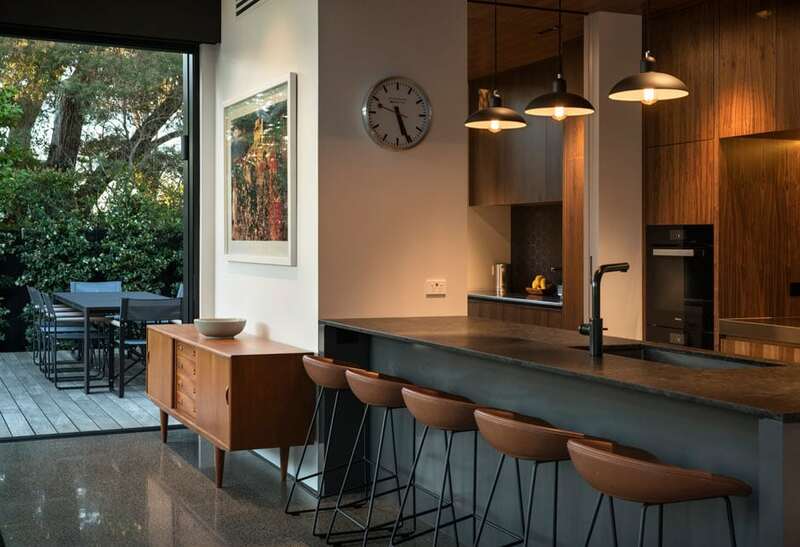 The mid-century modern aesthetic here reflects the clients’ favourite piece of furniture, a Clausen & Son vintage sideboard that faces the dining table. An outdoor dining space sits adjacent to the kitchen, with a barbecue, woodstore, pizza-oven fireplace and table for eight. At the far end of the lap pool is a more informal outdoor lounge that also has its own fireplace. 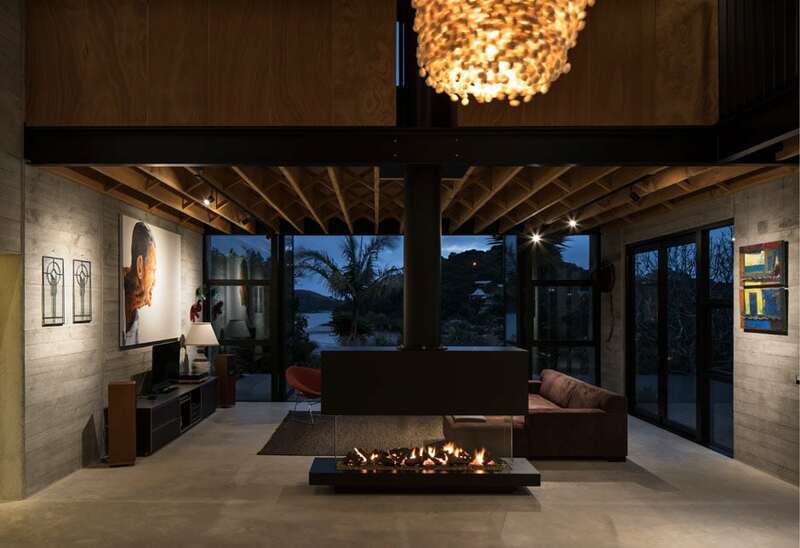 ABOVE Anzac Bay House by Vaughn Mcquarrie. 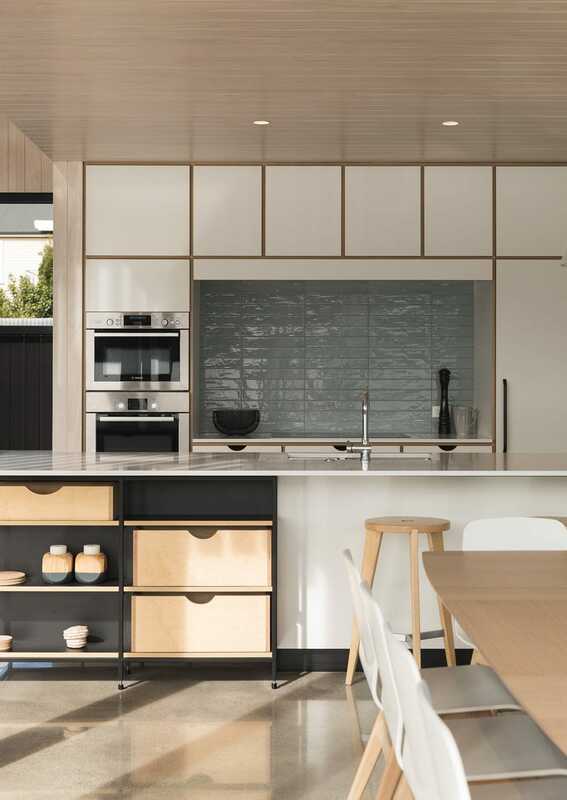 Because of the site’s outlook, the owners of this home were interested in referencing boatsheds in the design, appropriated to domestic scale and living. They also had a love of raw materials and their textures – board-marked concrete, in particular. The concept for the house was to create a central grand space surrounded by smaller spaces. The centre, which resembles a traditional boatshed shape, consists of a single open space created by parallel precast concrete walls with a skillion roof on top. Mezzanine spaces at either end, accessed by a sculptural helical staircase, contain a sleeping zone and a workspace. The single-storey structures surrounding the main living area contain guest accommodation and ancillary spaces that can be closed off when they’re not required. 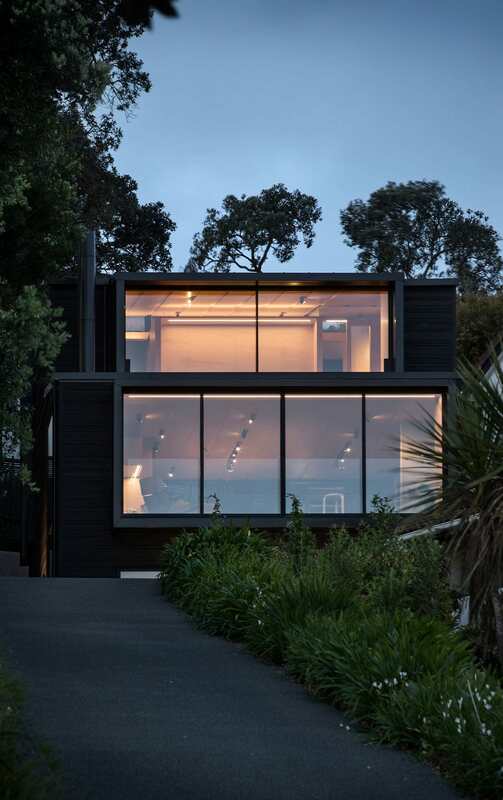 ABOVE Bay House by Strachan Group Architects. The challenge here was to create a private family home for four within a compact suburban context accessed by a shared driveway. 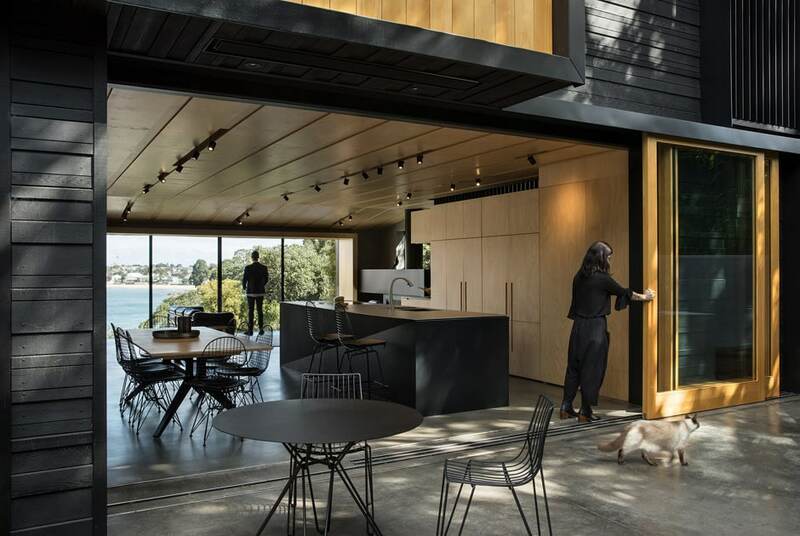 Framed apertures project the occupants’ attention towards the view of Auckland’s Castor Bay and the cityscape beyond, while privacy screens are artfully curated to omit neighbours and instead focus attention inward or across the series of connecting spaces. The home’s dark, box-like forms stretch and weave along the elevated south-facing site. Recessed into the bank, the concrete basement is fractured by a glass-roofed atrium that allows sun and natural light to permeate deep within the building. Guests are welcomed into this atrium by the sound of the cascading pond in the garden above, and circle up through the atrium onto a timber-planked bridge that connects the living areas either side. 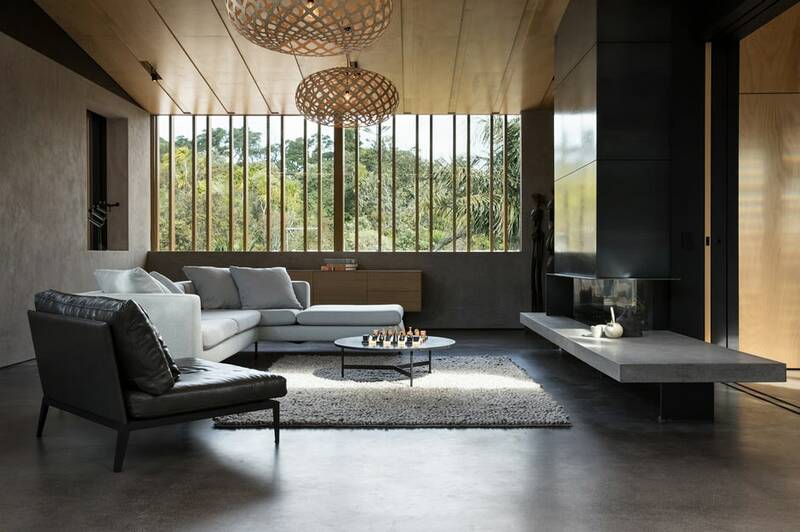 The rigorous deployment of the material palette to both the interior and exterior has resulted in a visually recessive home, full of warmth and texture. The horizontal exterior cladding is a direct reference to the striated sandstone cliffs that flank either side of the small North Shore bay. The black cladding deconstructs to make way for varied northern glazing, providing transparency through to the southern views. Roofs are tilted and lifted, reaching to the sun for passive solar design. 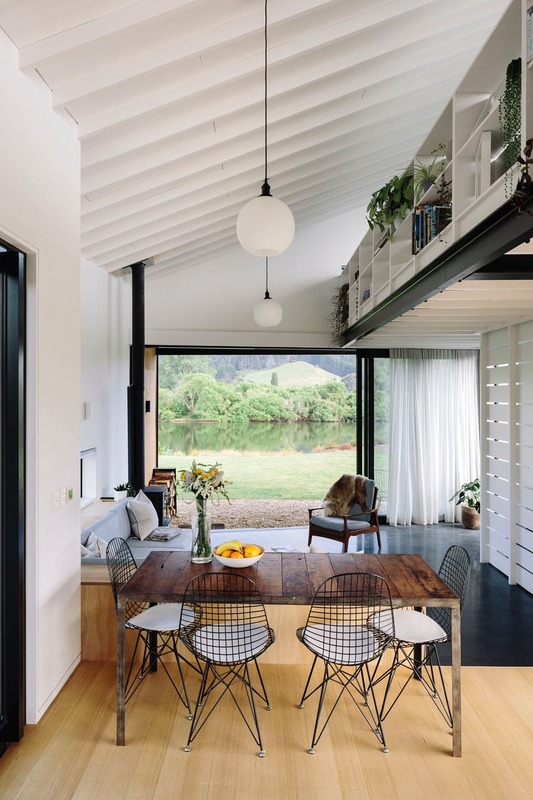 ABOVE River Retreat by Edwardswhite Architects. 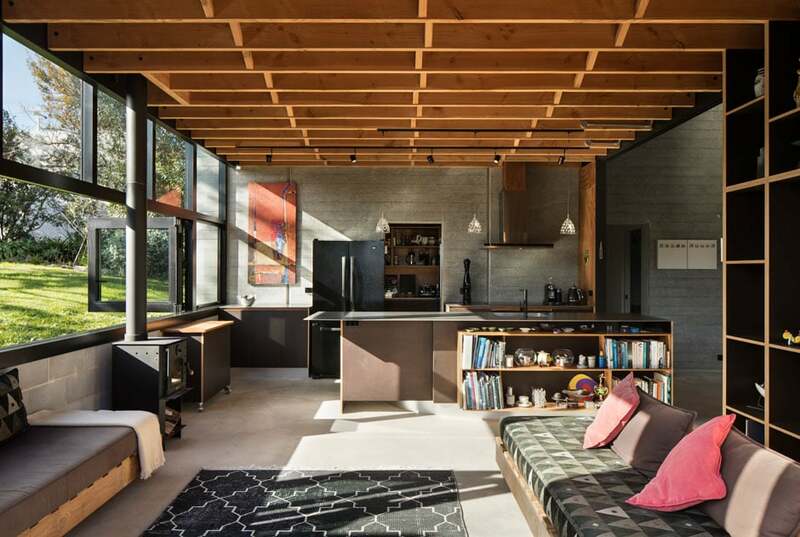 Responding to a narrow site, this small dwelling has been orientated to capture the best of the sun and views towards the Waikato River and Hakarimata Range. 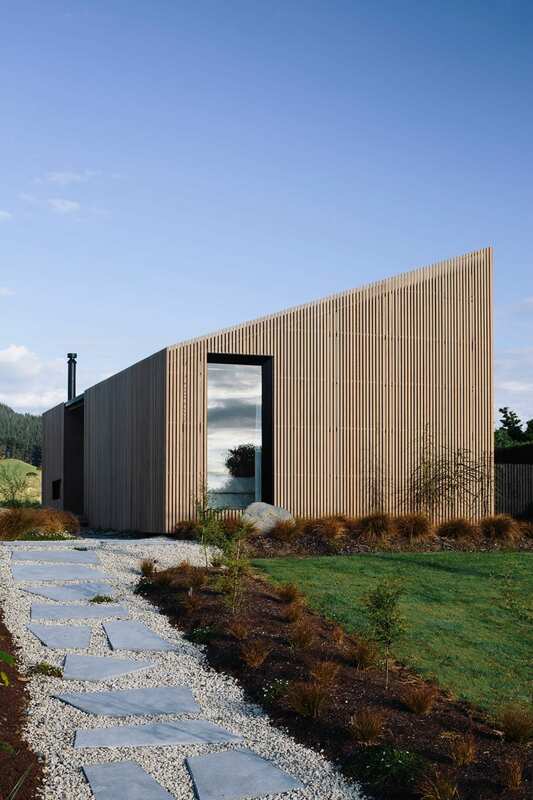 The skewed form of the house has an appropriate scale and presence within the wider landscape. Capturing a sense of informality was a key design driver in creating a restrained family home that is a simple yet elegant place to retreat. The kitchen is at its heart, while the deck sliced through the plan provides both morning and evening outdoor opportunities. The living space steps down into a light-filled volume reaching out to the river and a mezzanine pulls over above, with an exposed bookcase balustrade providing a sense of homeliness and enclosure. 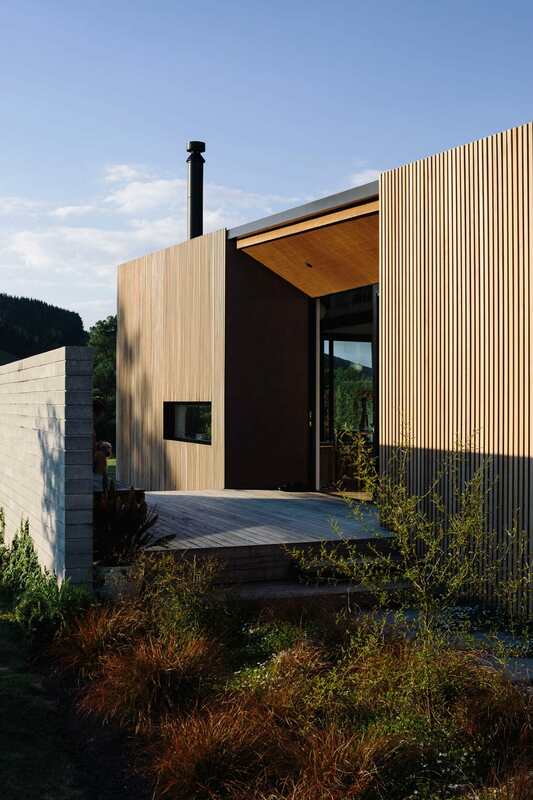 Custom rainscreen detailing enhances this modest, steel-clad home, allowing flashings and window frames to hide beyond while creating a distinct and compelling form in the landscape. 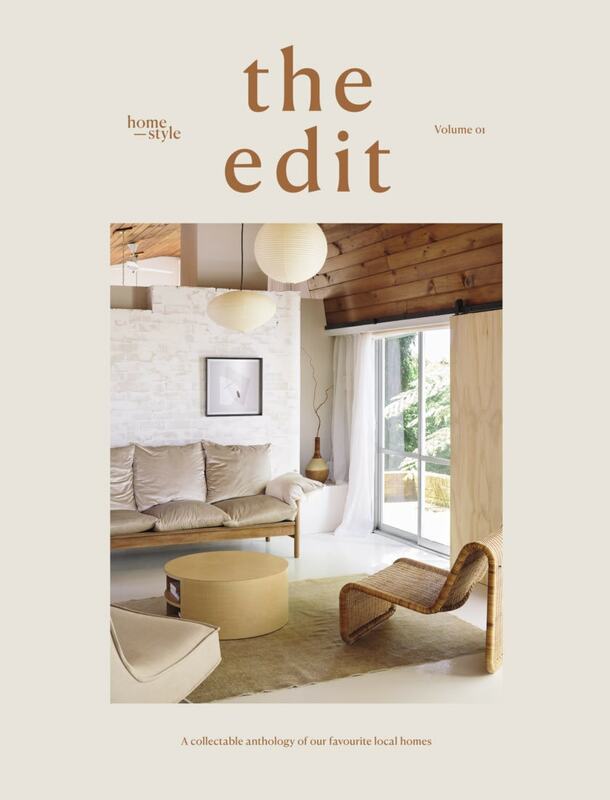 Encapsulating the qualities of the bach typology, the blurring of spaces and breaking down of thresholds corresponds with the expressed natural materials and tectonic detailing. ABOVE The Flow collection by LyZadie Design Studio. ABOVE The Plant Orbit by Designwell. The Plant Orbit was designed to bring nature indoors in a way that lets people interact with it and adapt it to their needs. 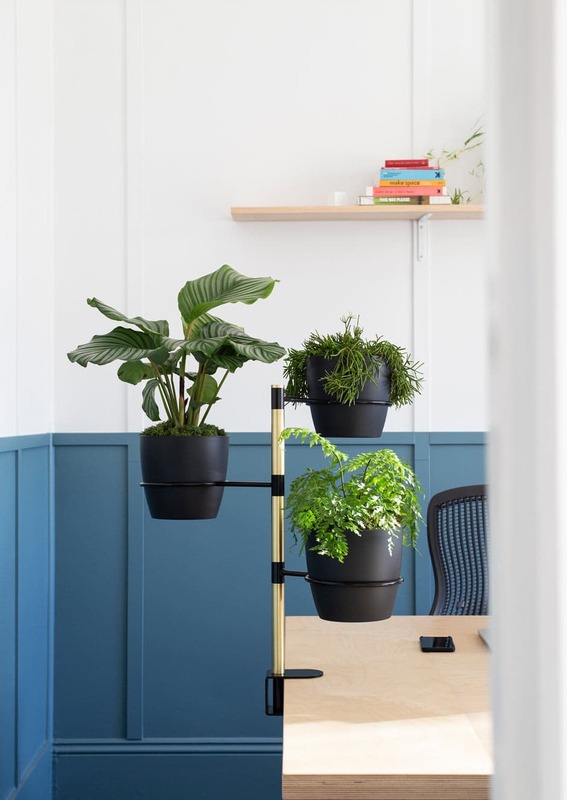 Rather than taking up valuable desk space, this plant stand can be clamped to a desk or a table, can hold more than one plant to create interest, and is adaptable to various spaces and uses. It’s also designed to be just the right height to create a visual screen between two sitting desks in an office context. 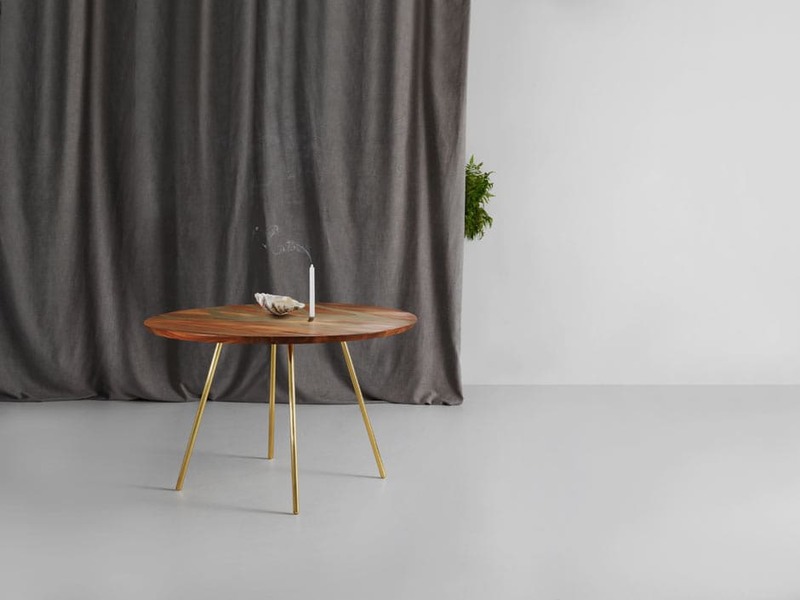 Locally designed and manufactured to order in small batches, The Plant Orbit is fabricated from powder-coated steel with brass features; each ring is sized to fit the standard off-the-shelf 180mm plant and pot. The centre shaft is a solid steel rod and brass tubing slips over this to separate the swing arms. The brass cap at the top is fastened with a stainless-steel fixing screw, and the clamp can be simply finger-tightened to create a solid grip on any standard desk, shelf or table. The plant arms rotate and can be easily moved around to change the positions.